My (perhaps annual) visit to Cardiff continues. After Monday’s Coffee Spot, the fabulous Washington Tea (younger sibling of Waterloo Tea), I am continuing in the same vein with today’s Saturday-on-a-Wednesday Supplement with the Barker Tea House, newly-opened younger sibling of the lovely Coffee Barker. Yes, I know, I’m going soft in my old age: that’s two tea places in a row! Well, if you think that’s bad, just you wait until you see what I have planned for you in a couple of months…! What made Coffee Barker stand out from the crowd was its lovely interior. Since I last visited, it’s been extended (and is ripe for a Coffee Spot Update) but, not content with that, the folks behind Coffee Barker decided to move one arcade over and open the Barker Tea House. If you thought Coffee Barker had a lovely interior, then wait until you see the Tea House! It has the same wonderful features that made me fall in love with Coffee Barker (person-swallowing sofas, uber-comfortable comfy chairs, quirky, retro décor) but takes it to a whole new level with a stunning first floor seating area. This place is simply gorgeous! One of the many things Cardiff does well is arcades. Usually Victorian in origin, these undercover parades of shops were the shopping malls of their day, but infinitely more elegant than today’s offerings. Cardiff has four that I know of: the Royal Arcade and Morgan Arcade (home of The Plan) down by the station, and the Castle and High Street Arcades up by the castle. The L-shaped Castle Arcade links Castle Street with the High Street and already houses the lovely Coffee Barker. So, when it came to opening the Barker Tea House, where else would you go, except across the road to the High Street Arcade? This, by the way, with its soaring, glass roof, is every bit as lovely as the Castle Arcade. They differ slightly: where the Castle Arcade has a second row of shops above the first, there is no external access to the first floor in the High Street Arcade, leaving it to the individual businesses to colonise the upper storeys. Barker Tea House occupies three adjacent units in the arcade. Such is the beauty and skill with which the interior’s been fitted out that you’d think they’d been built as a single unit, but apparently not. According to the staff I spoke with, they were separate shops and offices. Hard to believe, looking at it now! From the outside, the Tea House looks very similar to Coffee Barker, with its row of French brassiere style tables and chairs. Stepping inside, the counter’s to your right, a smaller, less complicated affair than Coffee Barker’s, lacking the huge espresso machine (more of which later), with the store itself stretching out to the left. Downstairs feels very similar to Coffee Barker, with the same mix of sofas, comfy chairs and interesting décor. However, a treat awaits at the far end, where a flight of stairs folds back on itself to deliver you to the first floor seating area. I would have been, if I’m honest, quite happy to sit downstairs, until, that is, I saw upstairs, one of the most elegant spaces I’ve experienced in a long while. Arranged around three light wells running along the right-hand wall, the upstairs is open and spacious, and yet, due to the clever placement of the furniture, simultaneously full of intimate spaces. My words will never do it justice, so I’ll simply leave you in the hands of the gallery (if you haven’t looked already, do it right now!). As the name suggests, Barker Tea House is to tea what Coffee Barker is to coffee. There’s an awful lot of tea here: I suspect not as much as at Washington Tea or Waterloo Tea, but an awful lot nonetheless. However, unlike Washington/Waterloo Tea, Barker Tea House isn’t such a haven for the coffee-drinker. The coffee, which is served by the cafetiere, is relegated to the bottom of the drinks menu: there isn’t even a choice of bean. That said, if you’re after coffee, you’re well served by Coffee Barker itself, just across the High Street, The Plan, down the way in the Morgan Arcade, or Torre Coffee, just around the corner on Castle Street. The cafetiere of coffee I had was perfectly acceptable and the surroundings I had it in were so sublime that I readily forgave the lack of choice. You can see what Cardiff blogger, A Cardiff Girl, made of the afternoon tea experience at Barker’s Tea House. If you liked this Coffee Spot, check out the rest of Cardiff’s speciality coffee scene with the Coffee Spot Guide to Cardiff. 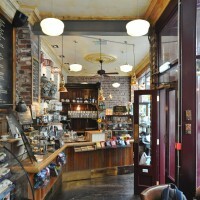 This entry was posted in Breakfast, Cake, Cardiff, Laptop Friendly, Lunch, Sandwiches, Saturday Spot, Tea Rooms, Victorian Arcades and tagged include by Brian Williams. Bookmark the permalink. Thank you for linking to my afternoon tea blog. Hope you enjoyed your trip to Cardiff!